Today (Friday) the world's top female cyclists have been travelling around Warwickshire for the third stage of the the OVO Energy Women’s Tour 2018. Starting in Atherstone the cyclists are making their way across the county in a 93-mile route and hit Kenilworth around 11am and arrived in Warwick around 11.20am. Several residents and groups of schoolchildren lined the route and cheered on the cyclists. 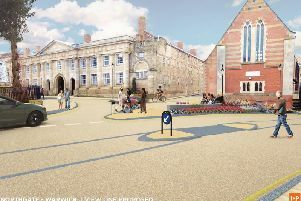 A spokesperson from Warwick Town Council, said: " It was great to see local schools support the even. We are proud for it to involve our town and we wish them all the best for the finish." Margaret Hawes, who was in the town as part of a coach trip, said: " We are on a coach trip and called into Warwick on the way home, which is Suffolk. "It was a coincidence that we saw it. "I thought it was good and there was a lovely atmosphere. "It is good to see events like that come through towns." There were some concerns as to the turn out of people supporting the event. Joan Hinton, who lives in Warwick, said: "I just got caught up in it this morning and got given a flag. I am still standing here supporting it even though I didn't come into town for it. "I was expecting more people to be around. When the One Show came through the town there was a lot of support. Usually Warwick does support things like this. "I love Warwick and it's a pity it not round going all the way around the town as I think that would get a lot of people out. "I think it being on a working day might be part of the problem. Everybody is in work or school. I think being on a Saturday or a Sunday it would ave far more support." Stage three of the OVO Energy Women's Tour will finish on Newbold Terrace in Leamington around 2pm.